Uncut Diamond Ring, Yay or Nah? 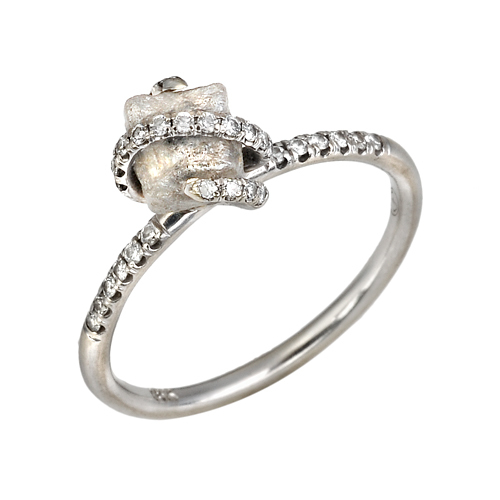 A new fad is on the horizon and is becoming increasingly popular, it is the uncut diamond engagement ring. Some of you may be completely unfamiliar with this new take on the traditional engagement ring so below is a picture of a diamond wrapped uncut diamond engagement ring. Its cheaper. Although uncut diamond engagement rings can end up costing thousands of dollars they are generally less expensive then their cut counterparts. Its unique. When was the last time someone flashed you their new engagement ring waiting for it to blind you when instead you see a non-shinning grey rock. Its rare. Although the new ring type is becoming more popular and now available in more places it is still a rare find. Your best bet is to find it on Etsy. Which in most cases means it is also handmade. Another plus! So why would someone want an uncut diamond engagement ring? Just like any other reason because they find it beautiful!